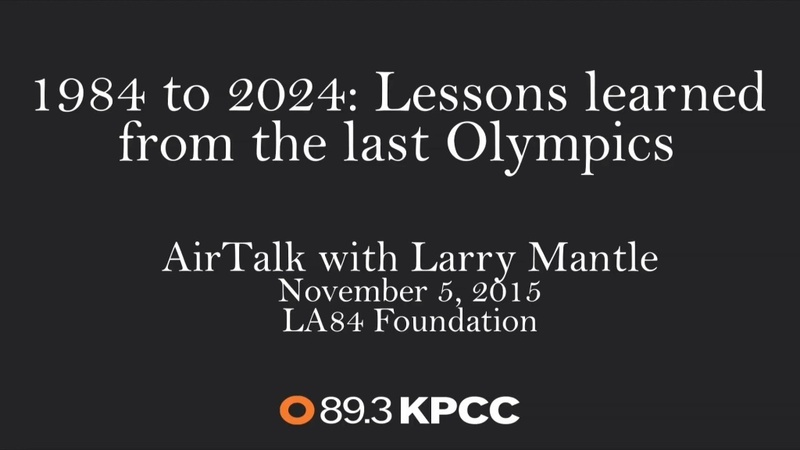 On November 5, Larry Mantle and a distinguished panel of guests, all of whom had a hand in the success of the 1984 Games, sat down to discuss what Los Angeles learned from the 1984 Olympics and how it can apply those lessons if the IOC calls its name for the 2024 Games. It has been said that those who don’t learn from history are doomed to repeat it. If the 2024 Summer Olympics are awarded to Los Angeles, repeating history wouldn’t be such a bad idea. The 1984 Summer Olympics in Los Angeles are widely considered the most successful games of all time, and now the city is once again vying for the Games, along with Paris, Hamburg, Rome, and Budapest. The decision on where the 2024 Summer Olympics will be held isn’t slated to come out until late 2017, which leaves Los Angeles with plenty of time to figure out what went right, what went wrong, and what can be learned from the ’84 Games if the International Olympic Committee chooses L.A. for 2024. 1984 was the first time in history that the government didn’t supply funding for the Olympics - local businessman Peter Ueberroth created and led an organizing committee that sought to fund the games through private donors, corporate sponsorships, and television deals. Despite concerns about venues, finances, and the L.A. landscape’s ability to handle the influx of people, the games went off without a hitch, L.A. got some great face time on a national stage, Ueberroth was named TIME Magazine’s ‘Man of the Year,’ and the Games generated a surplus of over $200 million dollars. Part of that was used to create the LA84 Foundation, which is still using the money to help fund local youth sports today. The 1984 Olympics weren’t a success for Los Angeles just because of the profit they turned. L.A. proved to the rest of the world that smart logistics planning and financial foresight could, indeed, make for a great Olympic experience that not only showcases the host city on a global stage, but also creates a lasting impact on the city’s culture and urban core. On November 5, Larry Mantle and a distinguished panel of guests, all of whom had a hand in the success of the 1984 Games, will sit down to discuss what the city learned from the 1984 Olympics and how it can apply those lessons if the IOC calls its name for the 2024 Games.